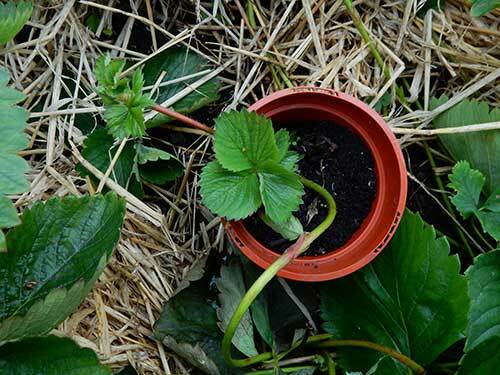 Propagating From RunnersFollowing this year's bumper crop of strawberries, it's a good idea to think about your strawberry patch for next year. Are any of your plants more than four or five years old? If so, it's worth starting a new generation now to replace them as they become less productive. So long as your plants are healthy, propagating new plants from runners is a good way to replace your stock. Look over the parent plant to make quite sure there are no hidden pests or diseases (viruses are common in strawberry plants but weaken the plant and can be easily spotted) and go to it. Select the youngest plants on your plot to be parents. Allow four or five runners to develop on these. On all other plants, remove all runners to ensure that the plant strengthens up for fruiting next year. The runners naturally produce a little plantlet with roots which you can encourage to grow, either by planting into the soil while it is still attached, or planting into a pot among the plants. If using the pot method, fill them with compost and either sink them into the ground such that their rims are just level with the soil surface, or stand them on the surface in such a way that they will not fall over. For both methods, it is essential that you water well and regularly to ensure strong growth. The new plants will be ready to move into their final allocated space within five weeks. Cut the runners from the parent and plant immediately. For a better crop in the second and subsequent years do not allow these new plants to flower or fruit in their first season. For new varieties swap healthy runners with other plot holders. 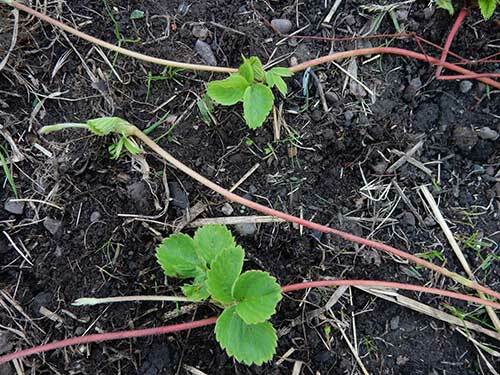 And remember to rotate your strawberry patch so that new plants are in clean ground. Varieties that work in Warriston include mid-season Cambridge (traditional, very sweet but need to watch disease on this one), mid-season Alice (sweet and disease resistant) and late-season Symphony (bred in Scotland, sweet and disease resistant).